We do not publish the price of our sales offerings as we would prefer to speak with you directly about the horse you are interested in, so please contact us via phone or e-mail. Looking forward to "horse talk"! We currently have some wonderful geldings in training for the endurance world. They range from 3 - 7 years of age - give us a call for further information. 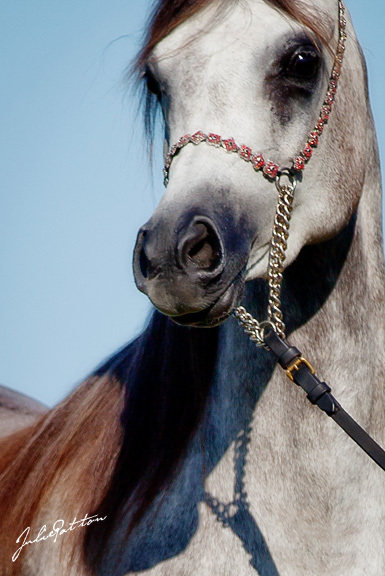 Hawk's Flight Farm has retained several Amir Jamaal daughters and granddaughters - their offspring are available for viewing by appointment only..
2009 grey Arabian mare. 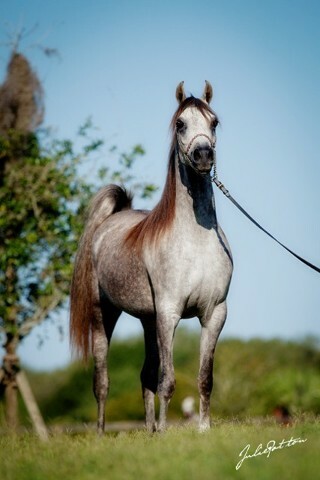 "Tutti" is a stunning Amir Jamaal daughter out of a Magnum Psyche daughter, Heartbreaker RA. Her eyes dominate her beautiful face and she is all snort and blow when she hits our presentation ring. This is another Amir Jamaal daughter that will excel in the show ring and the breeding barn.